So, this book was just utterly fantastic. From the very beginning of the book, once I was a few chapters in, I knew I would rate it 5 stars by the end of it, I just knew. Maas just puts you straight into the action without beating around the bush. It’s straight up and you dive right in without any unnecessary dragging. This is the second book in Sarah J Maas’ Throne of Glass series and this had so much more action and mystery to it. Throne of Glass built it up and set up the whole scene, and now we get thrown into the deep end with Celaena as she discovers some crazy mysteries. The magic element within the story is also building up and slowly creeping it’s way into the series which is so awesome and the romance and the characters are even better too! Chaol… Ah, I love him. Still so dedicated to his job and is still a loyal and trustworthy character. He has such a good heart and I love his feelings towards Celaena. Chaol is such an important character in the story and having him in it completes everything. I just love him. There were so many parts in the book where he would say or think something, and it made me squeal or made my heart flutter. I have completely diverted to shipping Chaol and Celaena. They are perfect, I love them, they need to be together, and my heart aches, thinking about the tragedy that happened throughout this book – I have romantic heartache thanks to this book! Prince Dorian is someone who can NOT be forgotten. Just as Celaena and Chaol are crucial in this story, Dorian is so important too! He is a lovable character. He is not like the other royals – kind of typical, but there’s no harm in that. He could be the perfect king. Kind, compassionate, considerate, and what gets revealed about his character in the second half of the book was surprising and exciting. There is a special place for him in my heart, and I am so excited to see him more in the next books, he is bound to play a big role soon enough! Now it is time to talk about the other aspects of the story. First, lets talk about the plot. My. Goodness. I love the way Sarah J Maas has set up this series. Everything was set up so perfectly in this book. No parts of the book seem rushed and everything that happens serves to hint at the greater purpose/outcome of the book. Halfway through there were some major tragic scenes that made my heart hurt physically. Then there was the PLOT TWIST AT THE END. Holy cow. I guessed it only once, but only as a completely wild guess with no help from hints whatsoever. The plot twist took my off guard and after I found out I could see where the little hints were dropped throughout the book, however they were very small, minor hints that never spoiled the twist. I was left hanging my a thin rope and I am way too anxious for Heir of Fire. There was also so much more action. More of Celaena going out and interrogating people and killing people. The mystery in this story is also starting to build up, tied in with the magic. The deeper Celaena goes into finding the truth of the evil that is growing, the more the magic starts to reveal itself. It’s incredibly enthralling and breath-taking to read! 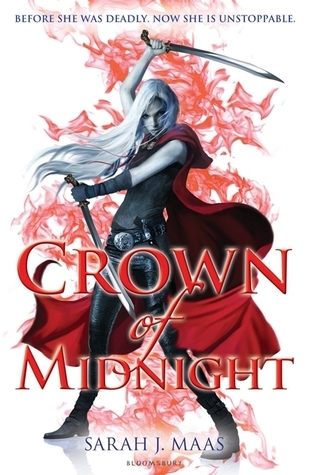 So that is it for my book chat/review of Crown of Midnight by Sarah J Maas! I hope you ca see why I LOVED this book so much. I have already ordered the next two books in the series and after The Heroes of Olympus series, this is my favourite. If you have read this book, please tell me your thoughts below so we can discuss and feel free to link your reviews so I can check them out! And if you haven’t read it, tell me if you will be picking it up soon thanks to this review or thanks to the hype going around. I always love your feedback! This entry was posted in 5 Star Rating, Book Reviews and tagged 5 stars, book chat, book review, books, crown of midnight, sarah j maas. Bookmark the permalink. Yeah I was frustrated about that too! I was like, Chaol what are you DOING?! I felt the same way after I read Crown Of Midnight. Such a great review. I felt the same about Dorian; I mean, I liked Chaol better in general, but I thought Dorian was a great character in his own way. You’ve gotten me so excited. Thanks! Yeah, I seemed to like Dorian in the first book a bit more than Chapel, because he’s just really charming!